The Foreign Ministry has blocked the security service initiative. 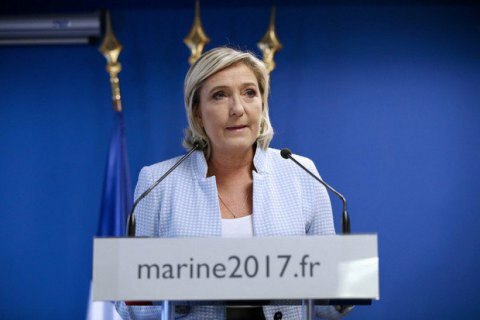 The Security Service of Ukraine (SBU) will not bar the French far-right presidential candidate, Marine Le Pen, from entering Ukraine despite her earlier approval of the annexation of Crimea by Russia. The SBU chief of staff, Oleksandr Tkachuk, told reporters on 6 February that Ukraine's Foreign Ministry advised the secret service against barring Le Pen from entering Ukraine. "No decision was made on an entry ban. Following the assessment of all information available and government agencies' opinions, a collegial decision was made not to deny her entry for the moment," Tkachuk told reporters in Kyiv. On 3 January, she said that the "return" of Crimea and Sevastopol to Russia was fair. This statement prompted protests by the Ukrainian Foreign Ministry. On 17 January, Le Pen once again promised to recognize Crimea as part of Russia if she is elected French president. The first round of the French presidential election will be held on 23 April 2017. The most recent opinion polls suggest that Le Pen can make it to the runoff but is likely to be defeated by former Economic Minister Emmanuel Macron.